Dante Lam is back in action with a new film titled The Rescue 紧急救援. There is no news about the plot yet but it is centered about a rescue operation at the sea. Expectations are high that the upcoming movie will follow the same style as Lam's previous hit action films, Operation Mekong and Operation Red Sea. Operation Red Sea, dubbed as 'China's first modern naval film,' became the second highest grossing film of all time in China and won many awards, including five titles from the recent Hundred Flowers Award. This is the fourth time Eddie Peng (Hidden Man) will work together with Director Lam, meanwhile, other casts include Wang Yanlin (The Big Bug), Xin Zhi Lei (Ruyi's Royal Love in the Palace) and Lan YingYing (Never Gone). 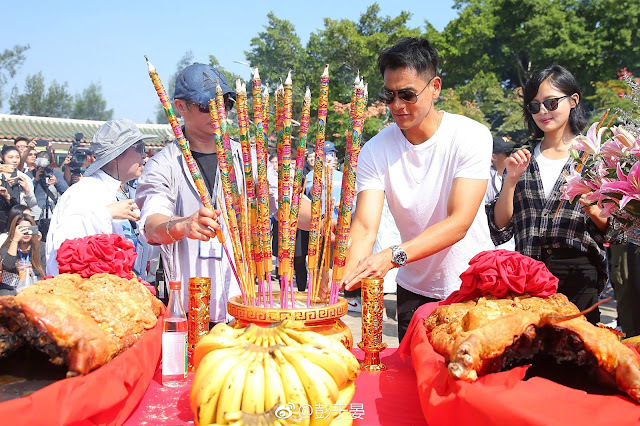 Many can't help but notice that Eddie Peng lost a lot of weight, which was due to rigorous training for the action film. The Rescue held a booting ceremony on Oct. 11, however, the cast members had been going through professional training many days before the filming. Due to that, Eddie Peng gave director Lam a nickname... Devil Lam. His co-actress Xin Zhi Lei agreed that director Lam was a devil but she added that they learned many new skills so the hard work is worth it. It looks like we can expect another heart-pounding action in the upcoming movie, however, this one has a hint of romance, unlike Lam's previous projects.